we had a great time at my mom's house with the family. 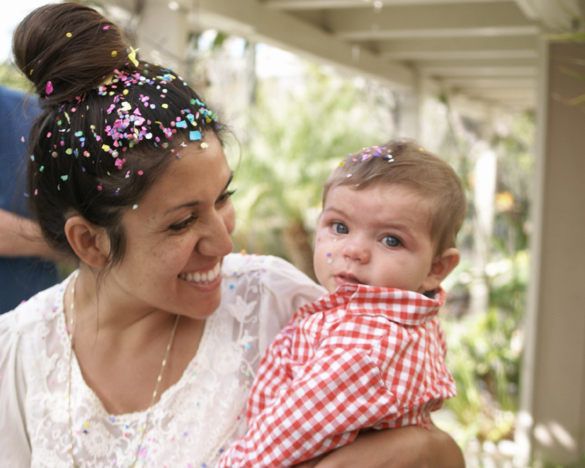 poor riv has been teething so he was a bit of a cranky bunny but was still able to partake in the fun of confetti egg madness. lucky kid! he also got to watch us play mexican train dominos. have you played this? such an easy, fun game - we've been playing it for years in my family and yesterday, we introduced 3 newbies to the game, including river. oh, the things he'll learn. eggs and games aside, i did want to let you all know that i've decided to take a break from sponsorships right now. i realize that i haven't been blogging consistently and while i try, i feel like that's the type of blog that can really help everyone through sponsorships and so, i'm closing 'er down for a bit. i've also heard that google reader is going away?? is this true? eek! and a happy april to you all! thank you so much to everyone who has swapped ads with me in the past. i've really appreciated it. we do cascarones too =) they are soo much fun!!!!! happy easter to you and yours!!!! !